In this Feb. 13, 2018, file photo, Gov. Paul LePage delivers the State of the State address to the Legislature at the State House in Augusta, Maine. The secrecy surrounding Maine’s pardon process recently came to light only because a former state lawmaker acknowledged that he had received a pardon from former Gov. Paul LePage. That revelation, from former state Rep. Jeff Pierce, raised questions about Maine’s pardon process and why it is shielded from public view. This is a discussion that should continue. Maine is one of just a few states that has made much of the pardon process confidential. Advocates of confidentiality say that this gives people a chance to put their criminal past behind them and to move on with their lives. On the other hand, keeping pardons secret fuels the sentiment that pardons are political tools used to help cronies, political allies and donors. The fact that a pardon is granted has long been confidential in Maine, but in 2017 the Legislature also made petitions for pardons confidential, returning the state to a practice that had been in place until 2013. Yet, a petitioner for a pardon must publish a public notice in a local newspaper and pardon hearings are public. Rather than this mishmash of confidentiality, the entire process — and the results — should be public. A pardon does not expunge a criminal record, but shields it from state agencies, such as the Maine Bureau of Investigations, which conducts background checks for employers and others. Court records surrounding the original conviction remain public. Most states require the governor to periodically report pardons to the Legislature, with reasons. “A public pardon process is an opportunity to have crucial conversations about our criminal justice system,” Emma Bond, an attorney with the ACLU of Maine, told the BDN. “It can even reduce the stigma and seemingly never-ending consequences that come with even the lowest-level convictions. “Keeping the process secret prevents those public conversations from taking place and also creates the perception that pardons are reserved for friends and political allies,” she added. Just before his tenure as governor ended, LePage pardoned Pierce for a 35-year-old, felony-level drug trafficking conviction. Pierce, a former Republican state representative from Dresden, was convicted of felony-level drug trafficking in 1983 after selling cocaine and marijuana to an undercover police officer. It was later revealed that the state clemency board recommended against a pardon for Pierce, but LePage granted it anyway. 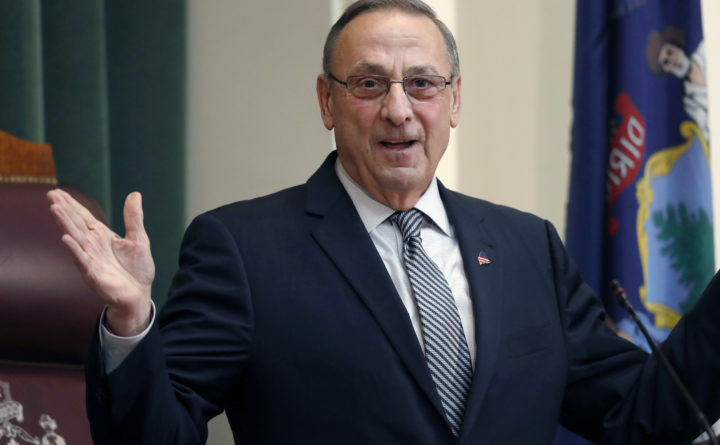 LePage granted pardons to more than 100 people in his eight years in office, but their identities are confidential under state law. Contrast the Pierce case with that of Lexius Saint Martin, a Haitian immigrant living in Waterville who was convicted of felony drug trafficking in 2008. He lost his refugee status as a result of the conviction, but his deportation was put on hold after a devastating earthquake in Haiti in 2010. Saint Martin was arrested last January and was deported in February, leaving his wife, a Maine native who was pregnant at the time, and children behind. He and his family asked LePage for a pardon. The governor denied the request in November. LePage also pardoned a dog that was ordered euthanized after it attacked two other dogs, killing one of them. The dog was spared by a last-minute court order. Pardons can be an important tool for fixing injustices. This week, Tennessee Gov. Bill Haslam, for example, granted clemency to Cyntoia Brown, who has been in prison for nearly half her life. When she was 16, Brown shot a man in the back of the head while they were in bed. She said she was forced into prostitution and scared for her life. She was convicted of first-degree murder in 2006 and sentenced to 51 years in prison. She will be released in August. Former President Barack Obama granted clemency to more Americans than any other president. He shortened the sentences of hundreds of men and women convicted of drug crimes, saying that their sentences were unduly harsh. Pardons can also be used — and abused — to reward friends. Former President Bill Clinton pardoned several people who had business dealings with relatives or donated money to Clinton campaigns and projects. He even pardoned his brother. The best way for the public to know whether a pardon is warranted is to make the process as transparent as possible. Instead of moving toward more secrecy, as lawmakers did in 2017, Maine should make its process open to the public as most states already do.